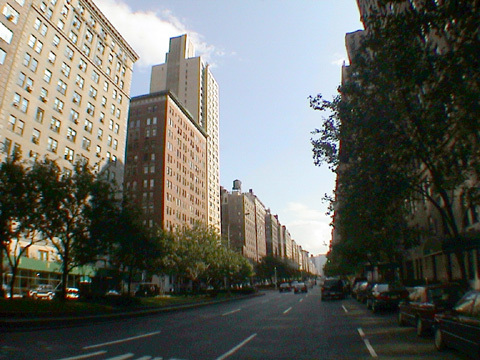 In the early 1970's, three apartment towers burst through the fairly uniform roofline of Park Avenue. This was the last of them. Completed in 1974, this quite conventional, 110-unit condominium tower, which was once known as Carlton Park, was designed by Stephen Lyras. The tower of 1065 Park Avenue rise far above the avenue's "cornice line"
The first was 733 Park Avenue at 71st Street in 1971 and the second was 900 Park Avenue at 79th Street in 1973. Reflecting the fact that when it was built its location was considerably to the north of the other two and that the Carnegie Hill District had yet to flourish into one of the city's most desirable residential locations, this building made no special effort to relate to the high architectural traditions of the avenue. It is essentially a typical high-rise tower of its period that proliferated further to the east and is quite out of place on Park Avenue. Nevertheless, the abundantly landscaped small corner plaza and deep arcade are quite pleasant as is the building's lobby and its neighborhood has undergone a tremendous gentrification and is now very desirable because of its cultural institutions, schools, proximity to public transportation, convenient shopping and considerable new construction in the vicinity. A small church separates this tower from another large tower in the middle of the block between Park and Lexington Avenues that was a mixed-use project of a school and apartments. This building obviously has dramatic views on its upper floors but the interruption of the avenue's traditional building "wall" and cornice line is abhorrent and of the three similar towers on the avenue this is the least elegant.